A lot of acronym and a lot of details but what the lens does is provide a sharp perspective for APS-C DSLR users. This DX format lens is designed for the purpose of the smaller image circle of a crop sensor. 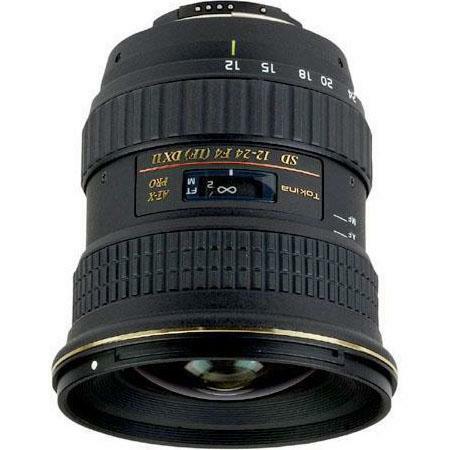 Much like a number of the other pro model lenses from Tokina, the 12-24mm f/4 AT-X 124 AF PRO DX II Lens also has a one-clutch focus ring mechanism that enables the user to shift from auto-manual focusing simply by turning the focusing ring towards the camera. An important new aspect in version II of the lens is the new AF motor for Nikon mount. This AF motor allows the lens to auto-focus on Nikon D40 and D60 series DSLRs. If you’re a Canon user the lens only offers a new coating that will reduce ghosting and flares as the older model already had the auto-focusing motor built-in. The lens consists of 13 elements including 2 aspherical elements and SD elements arranged in 11 groups. It offers the same 1.5x and 1.6x crop factor for Nikon and Canon camera respectively giving a equivalent field of view of a 18-36mm lens mounted on a full frame DSLR. The angle of view of the lens is 99 – 61°. The lens is a superb landscape photography tool to have, but for the lack of image stabilization. Compatibility The lens is designed for Digital cameras with APS-C sized CMOS and CCD sensors (DX) , not designed for cameras with Full Frame sensors (FX).